The cornerstone of solid phase synthesis is, of course, the solid phase. This is why we supply you with polystyrene resin, raw or loaded with one of several linker molecules. GU certified resins have been checked out on the Glyconeer – and are, in fact, the resins we use ourselves. This way, you can be sure your reaction starts on solid ground. 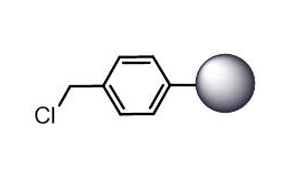 Chloromethylpolystyrene-divinylbenzene (100-200 mesh) - High quality Merrifield resin tested for usage on the Glyconeer. 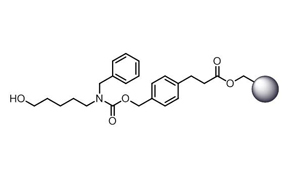 This linker, when used on polymeric resins allows for the use of a broad range of glycosylating agents and all groups, including esters. It is readily cleaved in a continuous flow photoreactor to release the glycan including a protected pentylamine linker at the reducing terminus. Literature:Eller, S.; Collot, M.; Yin, J.; Hahm, H.-S.; Seeberger, P.H. 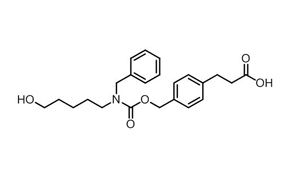 ; Automated Solid-Phase Synthesis of Chondroitin Sulfate Glycosaminoglycans; Angew. Chem. Int. Ed. 2013, 52, 5858-5861. All remaining reactive sites on the resin are capped. 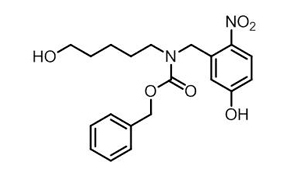 This linker allows for the use of a broad range of glycosylating agents and all groups, including esters. It is readily cleaved in a continuous flow photo reactor to release the glycan including a protected pentylamine linker at the reducing terminus. Literature:Eller, S.; Collot, M.; Yin, J.; Hahm, H.-S.; Seeberger, P.H. 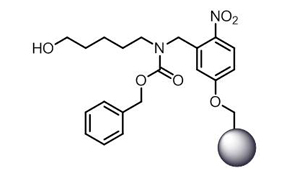 ; Automated Solid-Phase Synthesis of Chondroitin Sulfate Glycosaminoglycans; Angew. Chem. Int. Ed. 2013, 52, 5858-5861.